Palm Islands in Jumeirah, Jebel Au and Deira are the largest man-made islands in the world - featuring kilometres of pristine beaches, luxury hotels and sports facilities - they are set to become one of the most exclusive residential locations in the world. 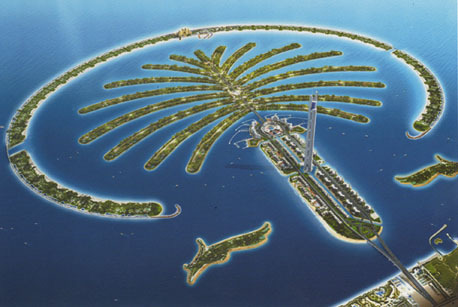 Built on the coastline of Dubai by Al Nakheel Properties, the unique feature of engineering and imagination, visible from space, the developments have been dubbed ‘The Eighth Wonder of the World”. The Palm is the ideal location to experience an exciting array of marine life. In keeping with the diverse offerings, divers have a choice of themed sites. Whether your ideal activities take place on the land or in the sea, The Palm delivers an experience unlike any other on earth. Why not explore Palm Island by air in a helicopter, seaplane or go around it by boat? The ultimate in escape and relaxation, The Palm Jumeirah is the perfect place to leave the world behind. For the ultimate shopping and dining destination, look no further than “The Golden Mile”. Located on the trunk of The Palm, The Golden Mile spans 60,000 square meters and contains 800 luxury apartments, 220 boutique shops and restaurants, all overlooking the blue waters of the Gulf. Delivering on the promise of becoming the ultimate entertainment destination, The Palm Jumeirah is pleased to feature Atlantis on the expansive beaches of the crescent, offering visitors all the unique amenities and entertainment the resort is world-famous for. For visitors and residents whose idea of escape is swimming with marine life, The Dive Experience at The Palm Jumeirah is a man-made water park that offers the ultimate in underwater adventure for both beginners and advanced divers and snorkelers. A destination like no other, with world-class golf, luxury desert resorts and a graceful bridge connecting to the mainland. An exhilarating experience for visitors and residents of all ages, The Palm Jebel All features an aquatic theme park with a sea village and an amusement park. For the lucky few who will make their home on this unprecedented location, among the distinctive residences to choose from,’ are water homes that spell out a poem written by His Highness Sheikh Mohammed Bin Rashid Al Maktoum. The Palm Deira is the largest and the last of Dubai’s inspiring palm-shaped islands. Upon completion, this ambitious project will house 8,000 villas along with a number of premier amenities, making it one of the world’s most coveted residential properties. Approximately 30 minutes drive from Dubai International Airport; The Palm Deira is also 6 kilometres from The World project and is designed to add an extra 400 kilometres of shoreline to Dubai. The Palm Deira is the final chapter for an extraordinary legend in the making.